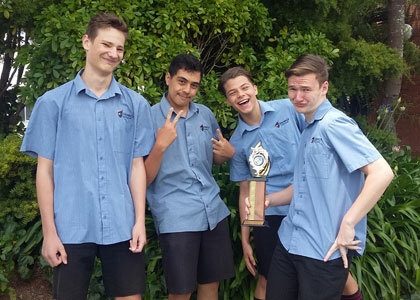 SUCCESS: Howick College year 11 students (from left) Gerhard van Deventer, Jordan Williams, Brandon Ward and Reece Jackson were awarded first place in a national problem solving competition. Times photo Laura Brookes. Find a problem in the community, come up with a solution, and give it your best shot. Those were the instructions given to four Howick College students as part of this year’s Future Problem Solving (FPS) competition – a competition that encourages students to take a proactive approach to creating and implementing solutions to real-life problems. Gerhard van Deventer (16), Reece Jackson (15), Brandon Ward (16) and Jordan Williams (16) were the only group from their school to participate in the competition, and never imagined their project would land them top place in the country for the Senior division of Community Problem Solving. The year 11 students looked around them for a community problem, which could be within the school setting or the local, national or global community under competition rules, and realised there was one right under their nose: the junior boys were falling behind the junior girls in social studies and history. Their solution? A digital game created for students, found in the online world of Minecraft. “We made a real effort to make it fun for them,” said Mr Williams. Mr Williams said this was a great opportunity to help the boys engage more in learning, and no doubt, to show a little comradery by levelling out the playing field. He joked that one of their biggest challenges during the production phase was convincing the technology department to let them play Minecraft on school internet. The game features a projection of Howick Historical Village with a quiz and practical activities in the hopes to increase the engagement of teenagers in their community. President of the Howick and Districts Historical Society Rob Mouncey says he is “delighted with what the boys have pulled together” and sees the whole experience as part of a growing engagement and partnership with local schools.